Who doesn't want to look like an ice skater? This move should be your go-to if you're after that strong, sculpted shape the athletes boast. "Ice skaters are great for increasing your core and balance ability as well as strengthening your legs," fitness expert and mother Ashley Horner tells Fit Pregnancy. Horner knows the move can be tricky, especially for beginners. 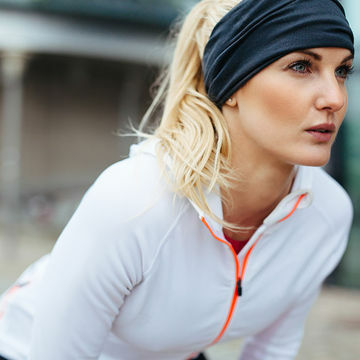 She offers some tips to mastering the complicated—yet totally effective—workout. "Start by standing on one leg and jump as far as you can to the side, landing on the opposite foot and bend down to touch the ground. Make sure your core is engaged and you're keeping good balance. If you're not ready to take a big leap and round the ground simply start with horizontal movement and you'll get the hang of it in no time," she says. "[Ice skaters are one of] my favorite bodyweight exercises because they are a full body exercise, which means you are using your full body to execute. No equipment is needed so these can be done anywhere, in a park, at the gym or even at home. They benefit muscular and cardiovascular systems increasing strength, flexibility and more," Horner says.